Beautiful lavender faux fur jacket from the limitededition collection by Helga Olafsdottir. 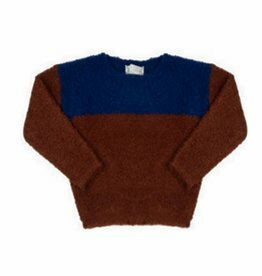 Gorgeous knit pullover with allover bats from Belgian brand Simple Kids. Heavy knitted round neck jumper by Finger in the nose. Beautiful cardigan with contrasting hem. LAST SIZE : 10Y!